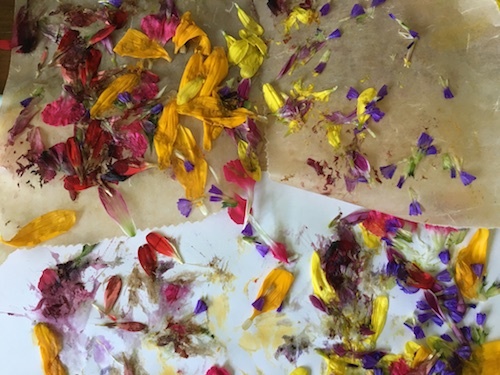 We’ve painted with a flower petal and printed with leaves, so now it’s time to print with petals! As we learned in the Wonder Wednesday 36 activity Chlorophyll Collage Prints, leaves get their green color from chlorophyll, but where do flowers get their color? Well, it varies. In plants, just like in animals, genetics decide what color hair, fur, or eyes one may have. Genetics decide the color of the flower, but various chemicals within the cells of the flower actually create the specific color determined by the genetics. Scarlet red, pink, blue, and purple come from chemicals called anthocyanins. Yellows, vermillion reds, and oranges are derived from chemicals called Xanthophylls, (aka carotenoids). These are also responsible for the colors of tomatoes, carrots, and other orange-y foods such as butternut squash. 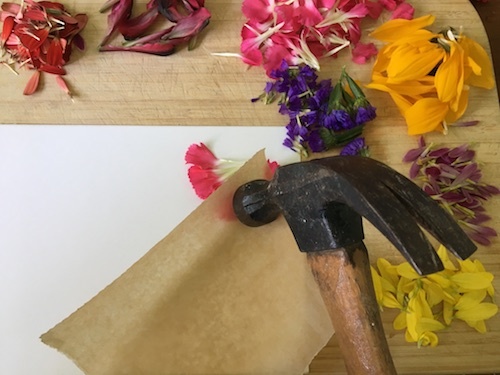 You don’t really need to know all that to enjoy the effects of printmaking with flowers, but isn’t it kinda fun to know a little bonus botany to go with your art? It’s like the why and how behind the scenes – and if you are doing this with students, it makes this activity applicable to STEAM learning. Flowers (gathered from the garden or store bought). Fresh flowers, rather than older or dried out, work best as they are “juicier” for printing. But I found that very juicy flowers, like day lilies, don’t work very well as they release more water than color. Paper: Drawing, hot press watercolor, mixed media, card stock, and perhaps even natural color construction or manilla paper, but I didn’t try those. Any paper that is a little thicker to stand up to pounding will work. The smoother the surface of the paper, the more clean your prints will be. A hard surface appropriate for pounding onto. If doing this activity indoors, be sure to place a protective layer onto the table such as thicker wood or plastic cutting board. A bowl to collect used flower petals. A towel or flat cushion to place under the pounding board to make the activity a bit more quite and further protect the surface underneath. Ribbons to decorate the paper s you are cutting it into shapes bookmarks or medallions. Stamps, markers, or other accessories to embellish the prints. Prepare and protect the surface or table you will be using for printing. Prepare the paper. Do you want to print onto a specific size paper, paper folded into cards, paper cut into bookmark shapes, paper ornament or medallion shapes, or plain sheets of paper? Gather the flowers and remove the petals. 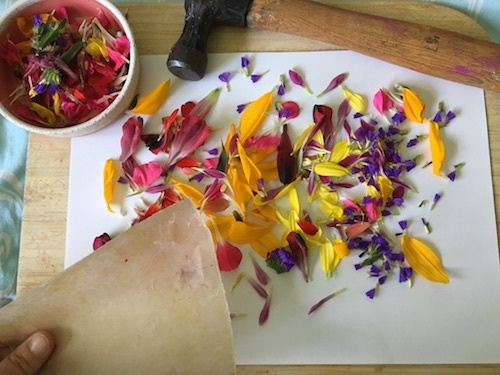 Collect and sort the petals by color. Place the paper onto the surface for printing. Secure with tape if you like. Arrange the flowers onto the paper. Cover with a paper towel or with wax paper. Pound to print. Medium pressure is appropriate for the pounding. There is no need to use full force by any means. Firm tapping works well. Gently lift your cover paper to see how your print is turning out. If you like it, stop, if not keep printing. You can even add more flowers if you like at this stage. Try layering your printing by starting with a yellow and then print a darker color flower over top. Experiment and have fun! 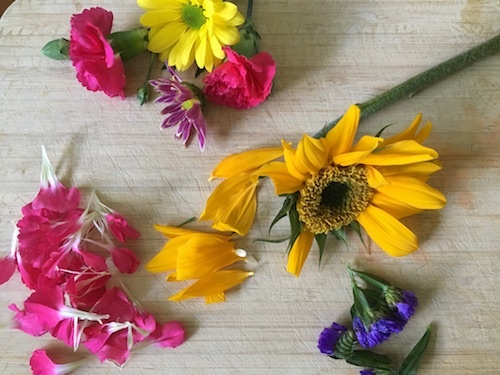 Make surprising discoveries about how flower colors transfer in unexpected ways to your page. 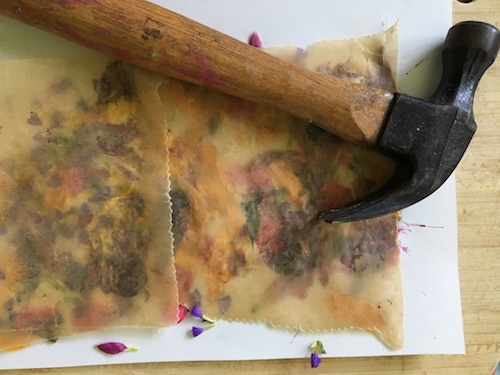 Once you are happy with your print, remove the plant material as best you can, let it dry, and then brush off any more plant material once the print is dry. Some bits may get stuck to the page, but that is okay. What might you turn your prints into? A bookmark- punch a hole and add a tassel with ribbon to the top. 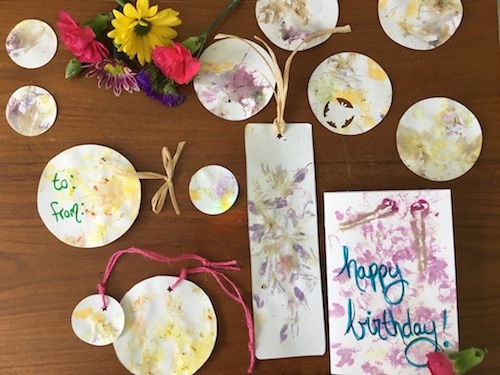 A medallion – cut out shapes from the page, punch a hole, add a loop of string, hand from a tree or around the class or house as decoration. A card- fold the page in half, write a note to the inside, and send to a faraway friend or family member. Turn your prints into card sets as gifts or school fundraisers, gift tags, and more! By creating clean borders and sharp edges with cropping, you add order to the abstract active prints, balancing out the art. Before printing, draw a design on the paper. You could even print a mandala with larger sections to fill, trace it onto art paper. Trace over your design with waterproof makers to avoid smearing when printing – remember the juiciness of the flowers is from water. One section at a time, print colors into the sections of the design. Like coloring the design in, but with petal printmaking! 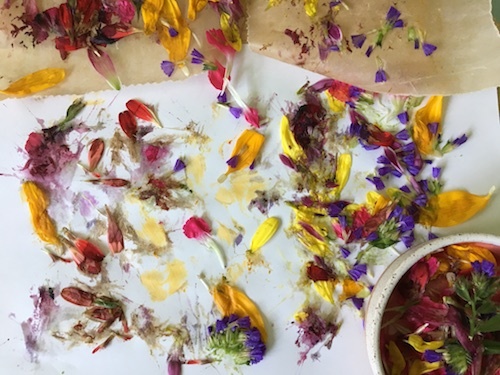 Before you take apart the flowers for printing, use them for some nature-study or nature journal activities. Learn about the flowers that you will be printing, such as to where they are native, cultural uses, growing tips, are they edible, etc. 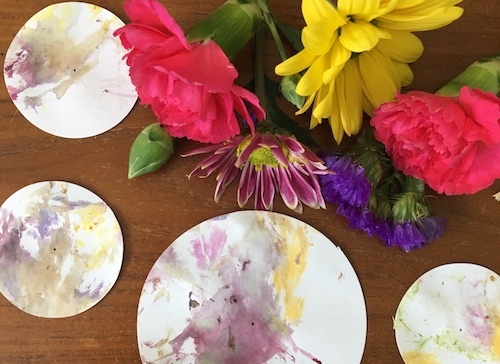 Make painted color swatches of the flowers. How many different shades of red to you see in a single red flower. Create a swatch for each shade you see. What is your favorite color flower? 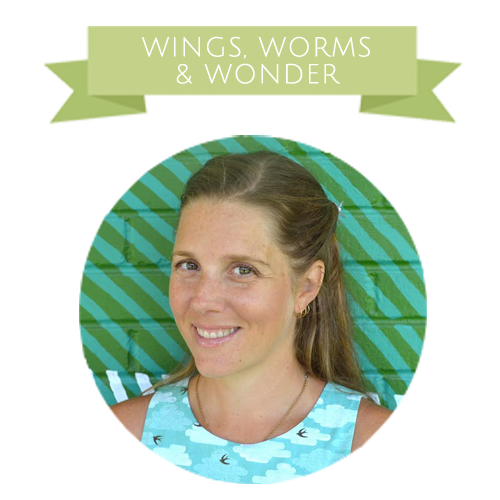 Check out the Wonder Wednesday 36: Chlorophyll Collage Prints activity here. 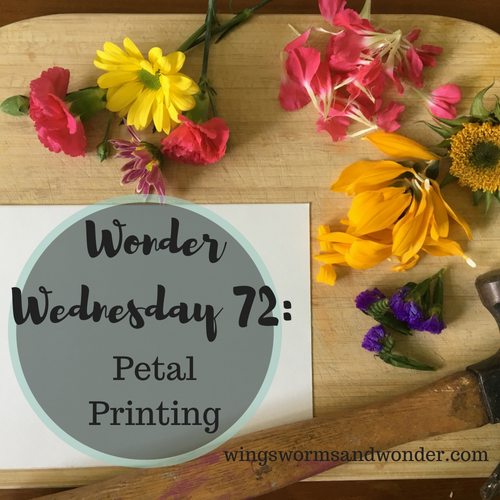 Check out the Wonder Wednesday 66: Petal Painting activity here & put those xanthiphylls, chlorophylls, and anthocyanins to more creative work! 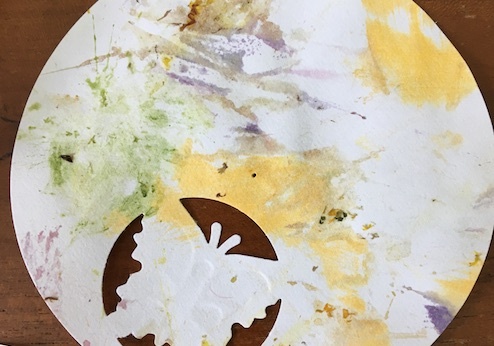 I was reminded of this activity in an email from the Montessori company Community Playthings, and thank them for the idea and the alliteration in this month’s activity’s title. See the original here on the Community Playthings blog. The young child in the photos makes a great flower rainbow!